FastMed offers walk-in urgent care clinics across North Carolina and Arizona. All you need to do is type in your zip code to find a location near you. We deliver top-quality healthcare that is accessible and affordable. The next time you’re sick, don’t wait for an appointment: we’re open 365 days a year, including holidays, for anyone who walks through our doors. Plus, we’re open for extended hours, so you don’t have to miss work or school. Come to a FastMed walk-in urgent care and start feeling better. What is a walk-in urgent care clinic? A walk-in urgent care clinic means you are welcome to walk in at any time without an appointment. Come to any FastMed Urgent Care to receive quality medical attention for non-life-threatening illness or injuries. If you believe that your condition could be lethal, dial 9-1-1 and get to a hospital right away. What types of services are offered at a walk-in urgent care? At FastMed Urgent Care you can walk in to get a DOT physical, a flu shot, or test for strep throat. We do pre-employment physicals and employee drug tests, clear up ear infections, vaccinate your kids, stitch up cuts, and x-ray anything that might be broken. We can also do EKG tests and sports physicals. Do walk-in urgent care clinics take insurance? Yes. FastMed walk-in urgent care clinics, located in North Carolina and Arizona, accept most major insurance plans. We also offer a discount program to help people without insurance manage their healthcare costs. Is a walk-in urgent care clinic the same as going to the doctor? Yes. Going to a FastMed Urgen Care clinic is essentially the same as going to see a local physician. The difference is that when you come to FastMed, you have the benefit of our entire medical team, including doctors, nurse practitioners, and physician’s assistants. 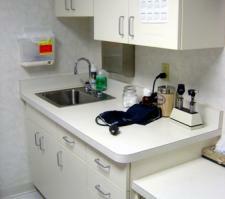 Unlike a doctor’s office, we have an on-site lab for testing, so you quickly get the results.